When was the last time you really stopped running around and just stood still? At a time when work, endless emails and a million distractions vie for our attention, the idea of taking time to just be present is more popular than ever. This is where sensory deprivation flotation pools come in. Flotation pools promise to give that stillness back to you, even if you have never meditated a day in your life. That said, sensory deprivation is really a misnomer, according to Justin Feinstein, a neurophysiologist who studies the effects of the practice in his laboratory at the Laureate Institute for Brain Research. The pools reduce external stimulation, and thus enhance internal sensation of a person’s world, he explains. Flotation pools originated in the 1950s with a wacky researcher named John Lilly, who tried to see what would happen if a person was submerged underwater for long periods of time, without the distractions of light and sound. Lilly published no scientific research, according to Feinstein, and instead wrote about his experiences taking hallucinogens while underwater. Lilly was ostracized by the scientific community, explains Feinstein, and the practice didn’t catch on. In the 1970s, when mediation and Eastern philosophy became fashionable, a much more palatable version of the flotation pool emerged, without the hallucinogens. For an hour at a time, at a spa or at someone’s home, a person could float face up in a warm tub or pool of very salty water. The temperature was set to match that of the human body, and the salt content was high enough that you could float effortlessly. With sound- and light-proofing, the desired effect was a feeling of weightlessness and a sensation that your body and the water were one. The practice faded away in the 1980s, which some attribute to the AIDS scare, when bathhouses and other communal places also closed – only to reemerge today, stronger than ever, as yoga, meditation and alternative medicine have also done. Commercial tanks have cropped up all over the country, promising an easier path to meditation and a new experience for people looking for another way to inner peace. The resurgence of flotation pools is relatively recent, says Feinstein, with the movement really coming back around 2010. In 2009, Feinstein tells me, there were only 20 flotation centers in the US. These days, he says there are over 300 places to float across the country. While the tanks offer a way to relax and self-reflect, for scientists like Feinstein, flotation also shows promise of helping people deal with anxiety. Flotation allows the nervous system a chance to relax, explains Feinstein. 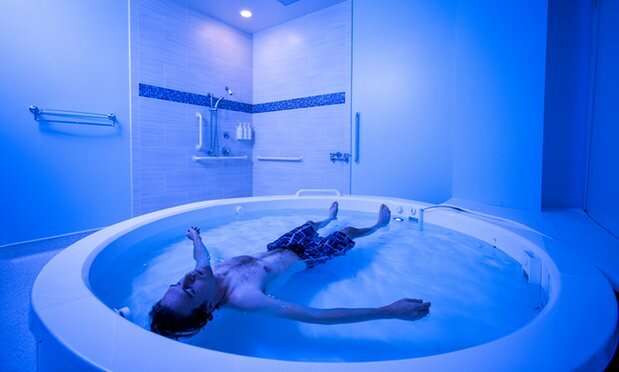 According to him, the level of relaxation achieved in a flotation pool is similar to what would be achieved with anti-anxiety drugs or mediation. Flotation pools also help people with anxiety become more aware of their own body: those with anxiety will often imagine that their heart is beating out of control, and a flotation pool allows them to lie still and really hear their own heart rate and breathing.